Vest-pocket Park 1965 — The Rev. Linnette C. Williamson Memorial Park Association, Inc. The urban unrest of the early 1960's led federal, state and local officials to focus attention on living conditions in America's inner cities. During Congressman John Lindsay’s mayoral campaign in early 1965, Thomas P. F. Hoving, who would soon be Lindsay’s first Parks Commissioner, called for the creation of open-space and green areas as small as one building lot: 100' x 20'. This meant expanding the city's park and recreational resources into inner-city neighborhoods most in need of new open spaces. 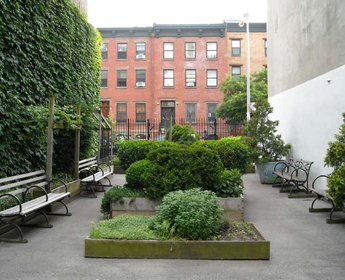 Late in 1964, The Park Association of New York City (now New Yorkers for Parks), under the leadership of Whitney North Seymour, Jr., began to assemble support to construct the very first vest-pocket parks in the city and the United States. Mr. Seymour brought together many public-spirited people, including the philanthropist Jacob M. Kaplan, the Rev. Linnette C. Williamson of The Christ Community Church of Harlem, and Milton Mollen, Chairman of the New York City Housing and Redevelopment Board. It was on Rev. Williamson's block of West 128th Street that the very first vest-pocket in New York City and the nation was opened in May of 1965. Students in the School of Architecture, Columbia University, designed the original park. The birth of the first vest-pocket park (along with two others opened on the same block later that year) received extensive local and national media attention. Federal, state and local officials (including Senator Robert F. Kennedy and Mayor Robert F. Wagner, Jr.) visited the park and judged it to be a model of inner-city, open-space design. A boom in the planning and construction of similar parks soon followed throughout the city and the country, sparking a drive for innovative designs of recreational equipment suitable for the new parks. The Park Association began restoration of the park in 1994 (see the two small photographs depicting the condition of the property in that year).